Join a partnership that takes you, your business and your industry, to the next level. We partner with companies who can help us grow industry and make business a little easier and more welcoming for everyone. AustralianSuper is Australia’s largest superannuation fund and is run only to benefit its members. AustralianSuper manages more than $140 billion of members’ retirement savings on behalf of more than 2.2 million members from around 270,000 businesses. Our sole focus is to provide the best possible retirement outcomes for members. AustralianSuper is responsible for investing the superannuation savings of more than 10% of Australia’s workforce, and we take seriously our responsibility to act in the best interests of members in this process. 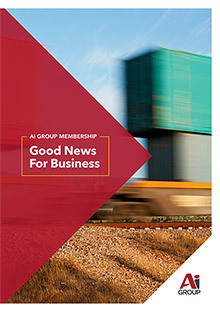 Being a member of Ai Group makes good business sense. Download our brochure to see why you should join. Or visit our Why join page to sign up for a consultation with one of our member representatives. Contact Us - Contact details for Ai Group departments and state and regional offices. Ai Group Management Team - Images for use by media. Media Releases - Current releases and archive. Ai Group Policy and Representation - Reports, submissions and representations to Government. Workplace Advice Service - Members' only national telephone advisory service for all your workplace related questions. Call 1300 55 66 77.